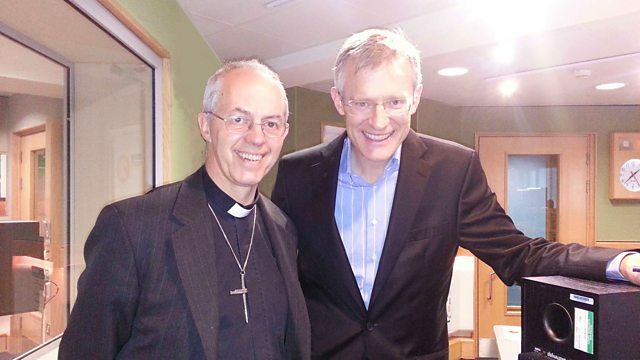 BBC Radio 2 - Jeremy Vine, The Archbishop of Canterbury answers the question: What Makes Us Human? The Archbishop of Canterbury answers the question: What Makes Us Human? Jeremy Vine explores the biggest question of all - 'What makes us human?' - with the Archbishop of Canterbury, Justin Welby, in a major BBC Radio 2 series. Jeremy Vine explores the most fundamental question of all: 'what makes us human?' with the Archbishop of Canterbury, Justin Welby, in a major BBC Radio 2 series featuring some of the leading thinkers of our time. This week Archbishop Welby will deliver his thoughts on the very essence of human existence. Broadcast live at lunchtime on BBC Radio 2, this essential series can be listened to again as a download. Constance Briscoe, AstraZeneca, What Makes Us Human and dogs on leads near livestock. Following her jailing critics suggest she has let down black women. Should the government stop the US drugs giant Pfizer's takeover of UK firm AstraZeneca? After 1, the Archbishop of Canterbury joins us to tell us What Makes Us Human. Should all dogs be kept on leads when they are being walked through fields of livestock? Archbishop of Canterbury – What Makes Us Human? Blues And Soul: The Soul Years 1966-1999: Vol.3 1972-1973 (Various Artists).